The BC Hydro and Power Authority is a Canadian electric utility in the province of British Columbia, generally known simply as BC Hydro. It is the main electric distributor, serving 1.8 million customers in most areas, with the exception of the City of New Westminster, where the city runs its own electrical department and the Kootenay region, where FortisBC, a subsidiary of Fortis Inc. directly provides electric service to 213,000 customers and supplies municipally owned utilities in the same area. As a provincial Crown corporation, BC Hydro reports to the BC Ministry of Energy and Mines, and is regulated by the British Columbia Utilities Commission (BCUC). Its mandate is to generate, purchase, distribute and sell electricity. BC Hydro operates 32 hydroelectric facilities and three natural gas-fueled thermal power plants. As of 2014, 95 per cent of the province's electricity was produced by hydroelectric generating stations, which consist mostly of large hydroelectric dams on the Columbia and Peace Rivers. BC Hydro's various facilities generate between 43,000 and 54,000 gigawatt hours of electricity annually, depending on prevailing water levels. BC Hydro's nameplate capacity is about 11,000 megawatts. Electricity is delivered through a network of 18,286 kilometers of transmission lines and 55,254 kilometers of distribution lines. For the 2013-2014 fiscal year, the domestic electric sales volume was 53,018 gigawatt hours, revenue was $5.392 billion and net income was $549 million. In 1957 BC Electric Company moved from its Carrall Street headquarters to a modern 21 storey building on Burrard Street. In 1998 it was converted to condominiums and renamed the Electra Building. BC Hydro was created in 1961 when the government of British Columbia, under Premier WAC Bennett, passed the BC Hydro Act. This act led to the expropriation of the BC Electric Company and its merging with the BC Power Commission, to create the British Columbia Hydro and Power Authority (BCHPA). The BC Power Commission had been established with the Electric Power Act in 1945 by Premier John Hart. The mandate of the Power Commission was to amalgamate existing power and generating facilities across the province not served by BC Electric, and to extend service to the many smaller communities without power. BC Electric Company began as the British Columbia Electric Railway (streetcar and lighting utility) in Victoria, Vancouver and New Westminster in 1897. Power was generated by coal-fired steam plants. Increasing demand in the Edwardian boom years meant BC Electric sought expansion through developing Hydro power at Buntzen Lake, and later at Stave Lake. Sensible growth and expansion of the power, streetcar and coal gas utilities meant that BC Electric was a major company in the region. An English financier named Robert Horne-Payne had secured investment funding and created a large company from what had been a patchwork of small regional electric railway and steam, hydro and diesel plants. Also about this time, sawmills and factories converted to electricity, further increasing the demand for electric power. BC Electric developed more hydro stations in the province. Similarly, small towns also built and operated their own power stations. More power transmission lines were also built. Dams and hydro-electric generating stations were built on Vancouver Island on the Puntledge, Jordan, and Elk rivers in the 1920s. BC Electric created one of the largest streetcar and interurban systems in the world in the Lower Mainland of BC with some 200 miles of track running from Point Grey to Chilliwack. There were both city street cars and interurban cars servicing Richmond, Burnaby, New Westminster, Vancouver, North Vancouver, and Victoria. By the time of the First World War, private cars and jitneys were beginning to affect streetcar traffic. The expansion of private automobile ownership in the 1920s further constrained the expansion of streetcar lines. New dams were planned, including the diversion from the Bridge River to Seton Lake, near Lillooet, but the economic depression of the 1930s halted this business expansion. Also with the depression came an increase in the ridership, and a decrease in the maintenance of the streetcar system. In 1947 the BC Power Commission completed the John Hart Generating Station at Campbell River. In the early 1950s the ageing streetcars and interurban trains were replaced by electric trolley buses, and diesel buses. BC Electric finally completed the Bridge River Generating Station in 1960. BC Hydro continued to operate the transit system by funding it with a small levy on electricity bills, until the transit system was taken over by BC Transit in 1980. In 1958 BC Electric began construction of the Burrard Generating Station near Port Moody. It opened in 1961 and, although it is now fueled only by natural gas, and operated only intermittently when needed, it continues to generate controversy due to its proximity to Vancouver and its associated greenhouse gas emissions. In 2001 it represented over 9% of BC Hydro's gross metered generation. With completion of new transmission capacity to the Lower Mainland from the interior of BC, Burrard Thermal Station is being converted into a large Synchronous condenser facility. On August 1, 1961, just days after company president Dal Grauer died, the BC government passed the legislation which changed BC Electric from a private company to a crown corporation known as BC Hydro. In 1988 BC Hydro sold its Gas Division which distributed natural gas in the lower mainland and Victoria to Inland Natural Gas. Inland was acquired by Terasen Gas in 1993. Between 1960 and 1980, BC Hydro completed six large hydro-electric generating projects. The first large dam was built on the Peace River near Hudson's Hope. The WAC Bennett Dam was built to create an energy reservoir for the Gordon M. Shrum Generating Station, which has a capacity of 2,730 Megawatts of electric power and generated 13,810 gigawatt-hours of electricity per year on average 2012-16. When it was completed in 1968, the dam was the largest earth-fill structure ever built. The Williston Lake reservoir is the largest lake in British Columbia. A second smaller concrete dam was later built downstream, closer to Hudson's Hope for the Peace Canyon Generating Station which was completed in 1980. 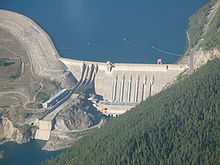 Under the terms of the Columbia River Treaty with the US, BC Hydro built a number of dams and hydro-electric generating stations including two large projects at Mica and Revelstoke on the Columbia River. The Keenleyside Dam on the Columbia River north of Castlegar and the Duncan Dam north of Kootenay Lake were also built under the same treaty and are used mainly for water control. Two generators were installed at Keenleyside in 2002, though these are owned and operated by the Columbia Power Corporation (a separate Crown Corporation). Kootenay Canal Generating Station on the Kootenay River between Nelson and Castlegar was completed in 1976. The Seven Mile Dam and Generating Station on the Pend d'Oreille River near Trail were completed in 1979. The Hugh Keenleyside Dam (left) was completed in 1968. The Arrow Lakes Generating Station (right) was added in 2002. In the late 1970s and early 1980s BC Hydro investigated the feasibility of geothermal power production at Meager Creek, north of Pemberton. They concluded from their testing that the underground rock wasn't permeable enough to justify large-scale production of electricity. Around the same time, BC Hydro initiated a project to develop a coal-fired thermal generating station at Hat Creek near Cache Creek, but abandoned the effort in 1981 due to strong environmental opposition. In 1989 the Power Smart and Resource Smart programs were initiated by BC Hydro to promote energy conservation as an alternative to the cost of creating new generating facilities. Since 2001, BC Hydro has focused on its conservation and energy efficiency programs, re-investing in its existing facilities, and purchasing clean, renewable energy from Independent Power Producers. According to the "British Columbia Energy Plan", released in 2007, BC Hydro must ensure that clean or renewable electricity generation continues to account for at least 90 percent of total generation. As of 2014, 97 percent of BC Hydro's electricity generation comes from clean or renewable sources and this generation only emits 730,000 tonnes of CO2 annually from thermal plants. In 1980 the BC Government established the BC Utilities Commission (BCUC) to regulate public energy utilities and to act as an independent, quasi-judicial regulatory agency regarding energy rates. In 2003 the BC government passed several pieces of legislation to redefine and regulate power utilities in British Columbia. 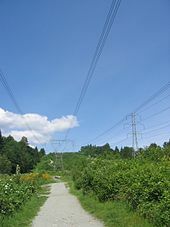 The Transmission Corporation Act created the British Columbia Transmission Corporation (BCTC) which plans, operates and maintains the transmission system owned by BC Hydro. Also in 2003, BC Hydro privatized the services provided by 1540 of its employees in its Customer Service, Westech IT Services, Network Computer Services, Human Resources, Financial Systems, Purchasing, and Building and Office Services groups. These services are now provided under contract by Accenture. While BC Hydro initially looked at Site C on the Peace River near Fort St. John in the late 1950s, it wasn't until 1982 that it submitted a Site C development project to the British Columbia Utilities Commission (BCUC). It was turned down by the BCUC at that time. Another attempt to revive it in the 1990s was blocked by environmental concerns. In 2004 the BC government's Energy Plan instructed BC Hydro to begin discussions with First Nations, the Province of Alberta and communities to discuss Site C as a future option. In May 2014, a federal-provincial Joint Review Panel released a report into the project's environmental, economic, social, heritage, and health effects. A notice of Site C construction commencing in 2015 was issued July 2015. Revelstoke Dam built in 1984 was the last new dam built by BC Hydro. The BC Hydro Public Power Legacy and Heritage Contract Act requires BC Hydro to meet the province's future needs for power through private developers. These acts have allowed Independent Power Producers (IPPs) to sell power to BC Hydro, which is required by law to buy it from them even at a loss. In 2011 BC Hydro spent $567.4 million on electricity from IPPs. In 2013, BC Hydro had 127 Electricity Purchase Agreements in its supply portfolio, representing 22,200 gigawatt hours of annual energy and over 5,500 megawatts of capacity. In 2013 those purchases will be $781.8 million in 2013 and $939.8 million in 2014, representing about 20% of domestic supply. BC Hydro exports and imports electric power through its wholly owned power marketing and trading subsidiary, Powerex, which was established in 1988. Powerex also markets the Canadian Entitlement energy from the Columbia River Treaty. BC Hydro belongs to a power sharing consortium which includes electric utilities in Alberta, Washington, Oregon, Idaho and California. In 2013 British Columbia's minister of energy and mines, Bill Bennett spoke to why BC Hydro was agreeing to a $750 million settlement with California over claims Powerex manipulated electricity prices. BC Hydro's Power Smart program encourages energy conservation among its residential, commercial, and industrial customers. The program also aims to promote energy saving retail products and building construction, and includes a "Sustainable Communities Program". Its in-house Resource Smart program is used to identify and implement efficiency gains at existing BC Hydro facilities. BC Hydro also practices energy conservation at its generating facilities through the continuous monitoring and efficient use of the water resources used to power its generators. BC Hydro is committed by the BC government's Energy Plan to achieve electric power self-sufficiency in the province by 2016, with all new generation plants having zero net greenhouse gas emissions by the same year. In 2013, BC Hydro released an Integrated Resource Plan which includes meeting at least 66 percent of the expected increase in electricity demand through increased energy efficiency. BC Hydro has also entered into energy purchase contracts with a new category of company created by special legislation, Independent Power Producers (IPPs) to buy electricity generated from intermittent renewable sources, mainly from small capacity run of river hydro and more recently, wind power, wood residue energy, and energy from organic municipal waste. There has been some criticism of this policy on the basis that it will result in Hydro paying significantly higher rates to private producers than it would have if the power were self-generated. BC has a policy not to develop nuclear power. As of July 2018, BC Hydro operated 58 electric vehicle charging stations in the province. In November 2013 the BC Minister of Energy and Mines announced a 10-year plan that will keep electricity rates as low as possible. Increases during the first five years will be between 9 and 3 percent annually. BC Hydro's profitability is affected by its large debt, estimated to reach five billion dollars by 2017. BC Hydro's Smart Metering Program in 2011 introduced the installation of Itron C2S0D Smart meters as mandatory. In 2013 BC Hydro offered the Meter Choices Program for $20 to $30 monthly. ^ Electrical | City of New Westminster. Newwestcity.ca. Retrieved on 2014-04-12. ^ BC Hydro (July 17, 2014). "BC Hydro's System". Archived from the original on 2013-04-19. Retrieved 2014-07-17. ^ BC Hydro (July 29, 2009). "Our Facilities". Archived from the original on 2010-07-31. Retrieved 2009-12-22. ^ BC Hydro (2014). BC Hydro 2014 Annual Report (PDF). Vancouver. Retrieved 2014-07-20. ^ B.C. Hydro. Power Pioneers (1998). Gaslights to gigawatts : A human history of BC Hydro and its predecessors. Vancouver: Hurricane Press. p. 135. ISBN 0-9698845-2-4. ^ B.C. Hydro. Power Pioneers (1998), op. cit., p. 73. ^ System Unavailable Archived 2012-03-19 at the Wayback Machine. Bchydro.com (2012-11-30). Retrieved on 2014-04-12. ^ "Energy Firms Propose Ethanol and Geothermal Plants in B.C." 22 July 2004. ^ "British Columbia Energy Plan 2007" (PDF). December 2016. ^ . Bchydro.com. Retrieved on 2014-07-20. ^ Fawcett, Max (9 April 2010). "Must the 'Big Smoke' Always Get Its Way? - The Tyee". ^ "Page or File Not Found" (PDF). Archived from the original (PDF) on 2011-06-11. Retrieved 2009-10-14. ^ Agency, Government of Canada, Canadian Environmental Assessment. "Canadian Environmental Assessment Registry - News Releases". ^ Ferreras, Jesse. "IPPs to cost BC Hydro almost $1 billion annually by 2014". Pique News Magazine. ^ Editorial, Reuters. "UPDATE 1-Canadian province settles California energy crisis case". ^ BC Hydro (2011). BC Hydro 2010 Annual Report (PDF). Vancouver. p. 114. Retrieved 2011-07-01. ^ BC Hydro (2004). BC Hydro 2004 Annual Report (PDF). Vancouver. p. 127. Retrieved 2009-12-22. ^ The Province of British Columbia - Home. Gov.bc.ca (2009-01-15). Retrieved on 2014-04-12. ^ "BC Hydro launches second phase of vehicle charging stations". CTV News Vancouver. 6 July 2018. Retrieved 22 September 2018. ^ Mines, Energy and (26 November 2013). "10 Year Plan Means Predictable Rates as BC Hydro Invests in System - BC Gov News". ^ "Auditor General sounds alarm over BC Hydro accounting". ^ "Page or File Not Found". Archived from the original on 2015-02-12. Retrieved 2014-12-23. ^ "Majority of smart meter holdouts bow to BC Hydro". ^ "B.C. offers smart-meter alternatives in response to controversy". Wikimedia Commons has media related to BC Hydro.